I’ve posted several times about law-related Wechat (微信) public accounts. They are an important resource for those trying to understand Chinese legal developments (or their absence) and their implications or impact. For the observer, it enables us to learn about new issues (or aspects of issues) that we didn’t know existed, and (depending on the topic), hear viewpoints other than the official one, or at least read hints of dissenting views. Those with the Wechat app on their smartphone can subscribe to these public accounts but it is also possible to find some these articles through an internet search. Note that the “Mr. Yong” about whom I wrote in 2016 still lurks on Wechat, so articles published may disappear. Below is an incomplete guide to some useful law-related Wechat public accounts–oriented to my own interests, to be followed up when time permits. Please contact me through the comment function or by email with additional suggestions. As I’ve written before Party/government authorities use Wechat public accounts to reach out to a public that is moving away from traditional media to their smartphones. SPC policy is encouraging courts to do so. There is some but not complete overlap between articles that appear on an institution’s website and Wechat account. There is complete overlap when more political matters are involved. 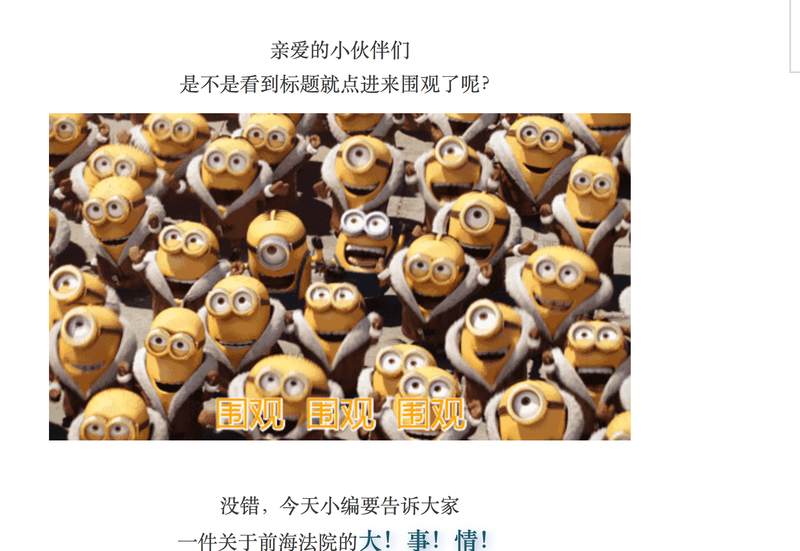 Even some articles published on institutional public accounts have a “netizen” tone and popular netizen slang and images, such as this one from the Qianhai Court public account. You’re right, today the little editor wants to tell everyone A BIG! THING! about the Qianhai Court! Some large institutions (Supreme People’s Court (SPC) and Supreme People’s Procuratorate (SPP)), have affiliated research, publishing and educational institutions, with each having a Wechat public accounts under its auspices. There is some overlap in articles, but others are unique to the Wechat account. The SPC has its official account: Wechat ID: ch_zgrmfy; People’s Court Daily: Wechat ID: renminfayuanbao; SPC’s research institute, The Institute for Applied Jurisprudence, Wechat ID: fayansuo; National Judicial College’s Wechat ID:falvshiyongzazhi (Wechat version of their magazine, Application of Law (法律适用) & account of its case research institute (司法案例研究院), Wechat ID: sifalyjy. There is also an account on diversified dispute resolution, linked to the Institute for Applied Jurisprudence: 多元化纠纷解决机制 (SIFAADR). The electronic database Faxin (法信) affiliated with People’s Court Press (which itself has a Wechat account: fayuanchubanshe) also has a Wechat account, Legal_information, as do the journals 中国审判 (Id: zhongguoshenpan) and人民司法 (renminsifa). (This list is incomplete). Some individuals affiliated with legal institutions have Wechat public accounts (presumably with the approval of their institutional leaders), among them: account of a Pudong New area judge, 法眼观察 （fygc20140416)–here is a recent article on the large number of cases in his and 19 other local courts; 法影斑斓 , account of He Fan, judge in the judicial reform office of the SPC, Wechat ID: funnylaw1978; CU检说法 (CU-JIAN), account of a local prosecutor (see an article on prosecutor’s assistants) 稻花蛙声(paddyfrog), recent article on judicial reform as seen from the bottom of the judicial food chain;法治昌明 (fazhichaming), with a recent article on the toxic system of performance appraisals. IP law–知产力 (zhichanli); 知识产权那点事, Wechat ID: IPR888888. Aggregators–智和法律新媒体, Wechat ID: zhihedongfang; 法律博客, Wechat ID: falvboke, 法律读品， Wechat ID: lawread. This entry was posted in criminal law and tagged criminal law, Wechat.